The Bicycle Architecture Biennale (BAB) is a prestigious showcase of cutting edge and high profile architecture that facilitates bicycle uptake around the world. After a successful first edition, inspiring thousands of visitors in 2017/18 to imagine new possibilities for urban living, the BAB will return in June, and applications for entry are now open. The second BAB will launch at the end of June, and will be a flagship event at WeMakeThe.City, Amsterdam’s multi-venue citymaking festival. It will then tour internationally at major architectural and citymaking exhibitions and events. Cities or organizations that wish to stage the BAB in 2019/2020 are encouraged to contact BYCS. The BAB exhibition will be comprised of curated projects hand picked by NEXT, along with - for the first time - projects chosen from the open call. The deadline for applications is the 15th of april. 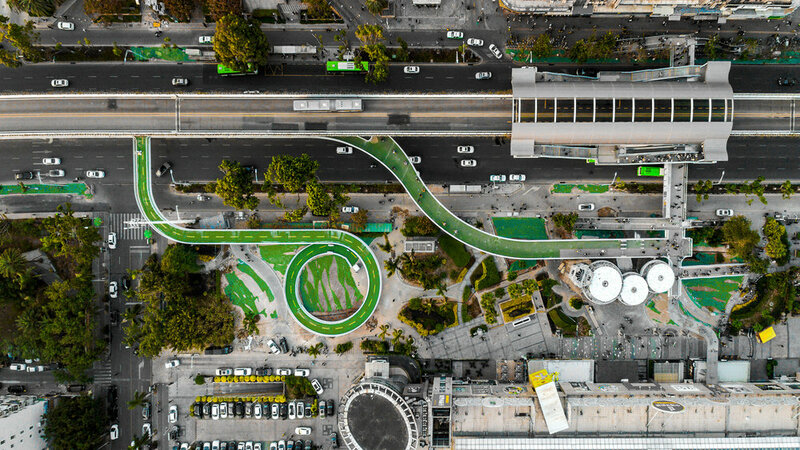 The first project already announced as featuring in the curated selection is the Xiamen Bicycle Skyway in China by Dissing+Weitling. The BAB was developed to strenghten BYCS’s mission, which is called 50by30 and calls for half of all city trips to be by bike by 2030. BYCS believes that cities that put cycling at the heart of urban design unlock massive social, economic and environmental gains. Other innovative projects include the Bicycle Mayor Program, a network of city cycling leaders active on every continent, and CycleLabs, an international network of collaborative spaces to test and scale cycling innovations. The first Bicycle Architecture Biennale was curated for BYCS by Dr Steven Fleming. It launched in Amsterdam during the international Velo-city conference. NEXT architects is an international architecture firm that has worked on research and design projects in the field of urban planning, architecture, interior, and infrastructure since its foundation in 1999. NEXT architects is located in Amsterdam and in 2004, NEXT opened a second office in Beijing, China. NEXT architects connects. By reflecting on the role designs play in their environment, NEXT incorporates 'connection' as a core theme in its portfolio and work method. The strength of this architecture firm lies in its ability to develop strong ideas that become a persuasive part of the project's specific context. Every project is unique and calls for a keen assessment of the specific needs and qualities of the location.